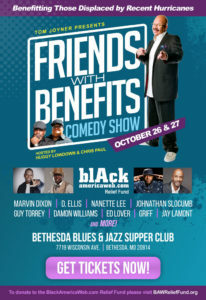 Order your tickets today for the BlackAmericaWeb.com Relief Fund “Friends with Benefits” Comedy Show. Go to Bethesda Blues and Jazz Supper Club to reserve your tickets. 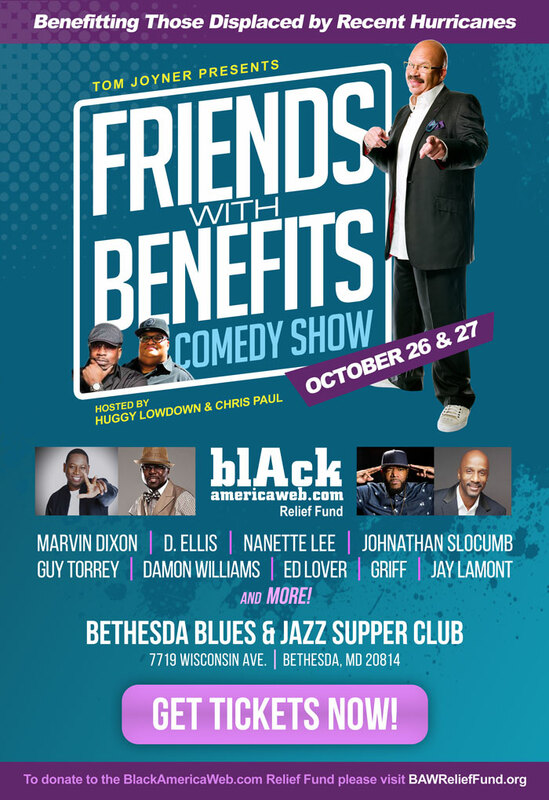 Joyner, along with comedians Huggy Low Down and Chris Paul, will headline the shows that will take place October 26 and 27 at the Bethesda Blues & Jazz Supper Club, 7719 Wisconsin Ave., Bethesda, Md. 20814. There will be two shows each night at 7 p.m. and 10 p.m.
Tickets can be purchased at BBJive.com (http://bbjive.com). HOUSTON, October 9, 2017 – Tom Joyner, host of the nationally syndicated Tom Joyner Morning Show®, distributed $50,000 to 50 Houston-area families who have been affected by Hurricane Harvey. The effort was just one example of Joyner’s distribution of over $500,000 raised to date for the BlackAmericaWeb.com Relief Fund supporting families, friends and those in the community that have taken in people impacted by both Hurricane Harvey and Irma. U.S. Congresswoman Sheila Jackson Lee (D-Texas), Houston Mayor Sylvester Turner and Carolyn Scantlebury, former Houston NAACP president, also participated in the distribution. They thanked Joyner for his help and reinforced the long road ahead for Houston’s recovery. Mayor Turner reflected on the significance of yesterday’s support on this morning’s Tom Joyner Morning Show. As Jackson Lee concluded her remarks, she presented Joyner with a congressional proclamation, thanking him for his efforts, then promptly took a symbolic knee as a nod to the current national movement to fight against police violence. She also urged the 50 recipients and their guests to stay vigilant, challenging them and local officials to get them the support they need. The event took place Sunday, Oct. 8 at the offices of MAJIC 102.1 FM in Houston. Joyner along with Turner, MAJIC deejays and other executives, including Pamela MacKay, the station’s Vice President-general manager, distributed funds to families who had submitted applications to the BlackAmericaWeb.com Relief Fund’s website, BAWReliefFund.org. The local NAACP office assisted the Relief Fund in helping to identify recipients. The Relief Fund is a 501(c)3 nonprofit. In 2004, Tom Joyner created the BlackAmericaWeb.com Relief Fund, building off his “Party with a Purpose”™ philosophy. Thanks to listener and corporate donations they were able to distribute over $2.5 million dollars specifically to families housing evacuees from New Orleans and the Gulf Coast, becoming what Slate.com called him, ‘The Voice of Katrina.’ Through the years, Hurricanes Rita and Sandy, and now Harvey and Irma, have once again called the Relief Fund to arms. For the current campaign, the BlackAmericaWeb Relief Fund has accepted over $500,000 in donations to support families who have taken in other families, or often even strangers. As is his mantra, Tom Joyner has elected to support all of the administrative costs of the efforts out of his own pocket, thus guaranteeing that 100% of every dollar donated goes to a family who has taken in an evacuee or an evacuee family. The relief fund is focused on providing financial support to people that are displaced or those hosting people that have been affected by the disaster. Rallying his audience of more than 7.4 million weekly listeners, Joyner has generated donations from a wide range of people eager to lend whatever level of support they could afford. To donate, go online to BAWReliefFund.org, text “relief” to 646464 or send a check or money order payable to “BlackAmericaWeb.com Relief Fund, Inc.” to BlackAmericaWeb.com Relief Fund, Inc., P O Box 803209, Dallas, TX 75380-3209. DALLAS, September 20, 2017 – Tom Joyner, host of the nationally syndicated Tom Joyner Morning Show®, is accepting donations the BlackAmericaWeb.com Relief Fund, Inc., a 501(c)3 nonprofit, to help families and individuals helping others directly affected by Hurricanes Harvey and Irma. Since Sept. 1, the fund has raised more than $360,000. Joyner has been announcing on air the donations he already has made. To donate, go online to BAWReliefFund.org; text “relief” to 646464 or send a check or money order payable to “BlackAmericaWeb.com Relief Fund, Inc..,” to BlackAmericaWeb.com Relief Fund, Inc., P O Box 803209, Dallas, TX 75380-3209. Outlines the details of how you have taken in survivors and are assisting those who have been directly affected by Hurricane Harvey. Includes your complete name and contact information (including address and phone number), the names of the people being assisted along with references (i.e., church pastor, community leader or employer) who can verify on your behalf.